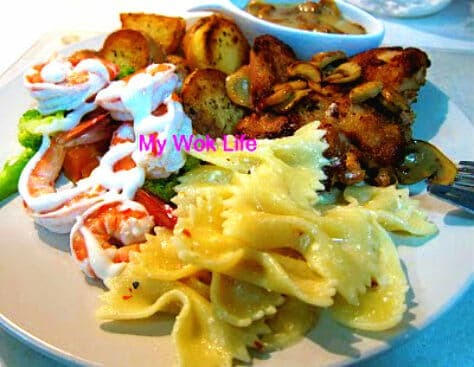 It’s beautiful in appearance with the choice of bowtie shaped pasta, and light savoury taste for the palate as a side dish with the use of sour cream instead of full cream or butter. Spice the pasta dish up with some chili flakes or paprika, this pasta is imaginably delicious and appetizing. There was this old male friend of mine, asked me, where to get the sour cream, as he wanted to get one for his baked potatoes the other time. He tried looking for it in the supermarket at dry goods section (where you find bottled mayonnaise and other dressing), but in vain. So, now you know you won’t be able to find it at the dry goods area, of course. Fresh sour cream has to be refrigerated! Find sour cream in small tubs from the chilled compartment where you find butter, margarine, yogurt and whipped cream (smile). 1) Bring a pot of water to a boil over high heat. Add salt to dissolve in the boiling water. Reduce heat to medium fire, add in bowtie pasta to cook till almost al-dente (Not too hard, but not too soft, too). Drain well and place in a large bowl. Drizzle 2 tablespoons of olive oil and coat well with the pasta, to avoid sticking when cooled. Set aside for later. 2) Heat large skillet with olive oil over high heat. Add garlic and stir-fry constantly till fragrant. Reduce heat to medium fire, return pasta to the skillet and add chicken broth. Cover skillet with lid and simmer for about 10 minutes, or until chicken broth almost dries up. 3) Combine sour cream with the pasta, and further simmer for another 5 minutes till chicken broth completely absorbed by the pasta, and leave only the whitish layer of sour cream well coated on every bowtie. Sprinkle salt and add chili flakes, stir fry to combine well. Divide into plates and serve. Sour cream might be melted into tiny lump-like appearance, when heated. It does not affect the taste though, but if you really do mind, you may actually add and dissolve the sour cream into chicken broth in the pan using a hand whisk before adding the pasta to simmer. It should help to improve the emergence of cream and broth. Variation: If some days, you wish to cook this pasta as the only mains for the meal, add some sautéed chicken fillet strips and button mushroom slices. Simply add the fillet and mushroom, after adding the chicken broth, to simmer them altogether. A decent portion of sour creamed pasta (as sides) counts about 300kcal. Reduce calorie intake by using Light sour cream and fat free chicken broth instead of full fat versions. This is the savoury 4-course Western cuisine made at home. A serving of this full set may load you with about 900kcal. Well, it’s the day! Last day of the year. And, I will ‘see‘ you next year in 2010.. Wish all a Happy and Prosperous Year ahead, full with gastronomic home cooking! 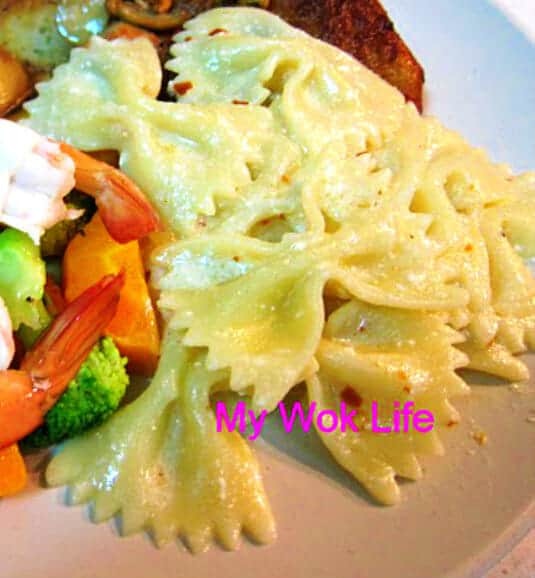 Tips: The wrinkled part in the middle of the bowtie pasta is the hardest to be cooked and softened. Take note and texture-check, if possible.